On the other hand, since the salmon shipments were back to back, it was pretty much the only seafood we ate for two entire months and by the end I never wanted to see it again (I know it doesn't seem like much, but trust me, 10 lbs of fish is a lot to go through). Anyhoo, my boycott didn't actually last that long, it took me only a few months to get back on the salmon bandwagon. One of the best things that came about doing a fish share was figuring out creative ways to use the same fish. There are only so many variations you can make to baked fish before getting excruciatingly bored with it. Some of the highlights of my salmon experiments were salmon panang curry, beet cured gravlax, and my favorite by far--crispy skin salmon served with whatever vegetables I had on hand. The beautifully crispy and crunchy skin is really what makes this dish shine, so feel free to make any adjustments you need as long as you don't mess with the skin...or else (I'm just kidding!...or am I?). I highly recommend getting a fish spatula if you don't already have one, it will make your life a lot easier if the fish skin is giving you a hard time and sticking to the pan. Avoid using a non-stick pan for the salmon, though it may seem like it would make the process easier, the skin will not come out as deliciously crispy compared with stainless steel or cast iron. Serves 2 with purée leftover. Bring 3 to 4 inches of water to a boil in a large pot with a steamer insert. 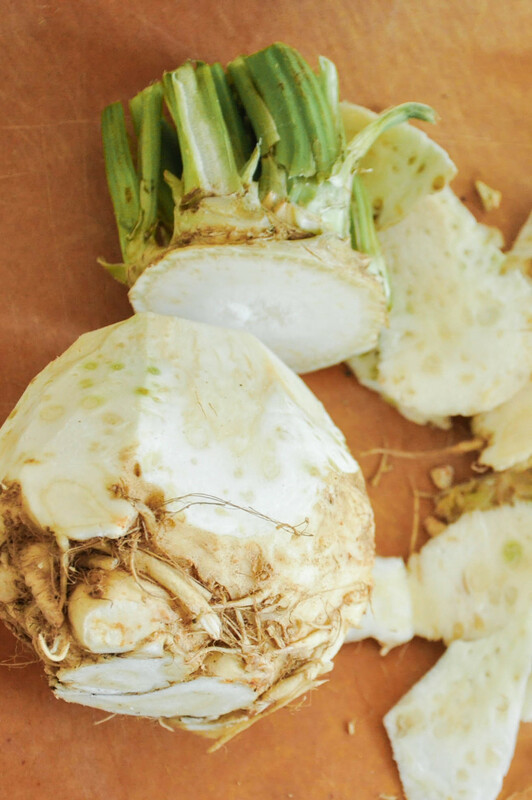 Meanwhile, peel the celeriac and kohlrabi with a knife. You want to make sure to remove any parts that seem hard, stringy, or woody. Cut into medium pieces. Peel and cut potatoes into medium pieces. Steam vegetables for 25 minutes. 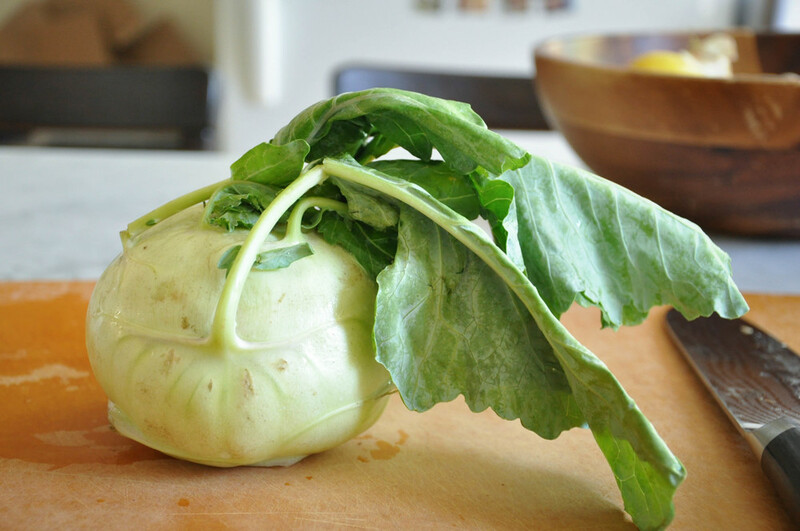 After steaming, remove lid and let vegetables air out and release excess moisture for 2 minutes. Transfer to a large bowl. Add scallions, butter, salt and mash with a spoon or whisk (or if you are lazy like I am sometimes, you can use an immersion blender to quickly bring the mixture together). Cover and set aside. Blot the salmon with a paper towel to remove any excess moisture and generously salt and pepper. Coat a large, heavy bottomed stainless steel or cast iron skillet with canola oil. Turn the heat on medium-high but before the pan has time to get scorchingly hot, place the salmon in skin-side down and let it heat up in parallel with the pan. 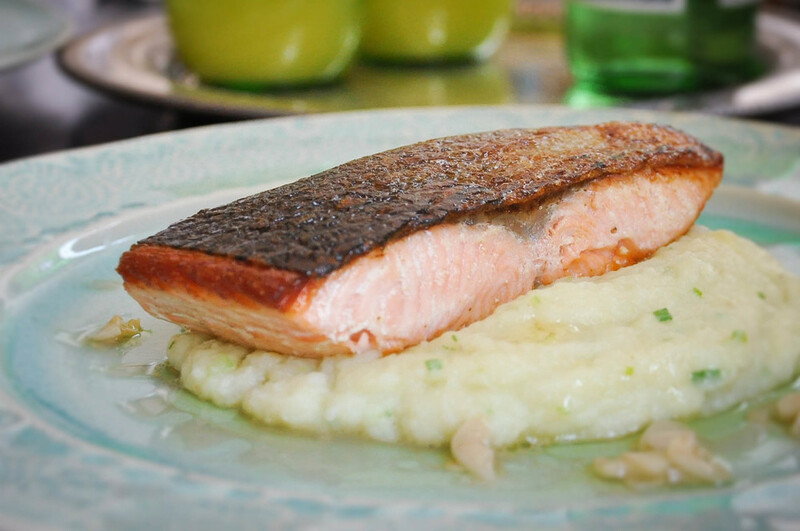 Depending on how thick your salmon is, cook for 5-7 minutes, you want the fish just slightly rare in the middle. Try not to disturb the fish and don't worry if it seems to be sticking, it will let up by the end once the skin starts getting nice and crispy. In the meantime, on medium heat, melt 1 tbsp of butter in a small saucepan and add garlic. 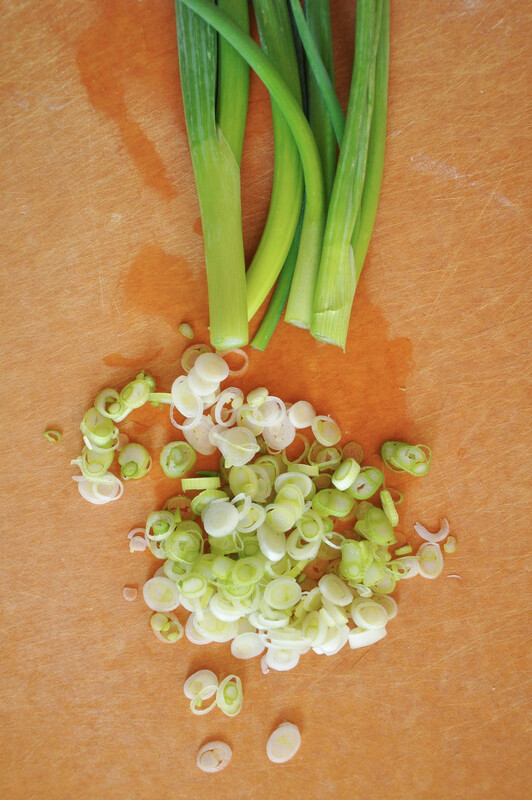 Cook for 1 minute until garlic is slightly golden and fragrant. Add white wine, a pinch of salt and pepper and reduce down until only a few tablespoons of liquid remain, about 4 minutes. Turn off heat and set aside. By now the salmon should be almost done. Check to see the skin is a nice, crispy brown, if not, give it another minute or two. If the skin is sticking to the pan, take a fish spatula and gently try to scrape and lift the skin off the bottom. Once the skin is crispy, turn off the heat and flip salmon. Let the residual heat sear the flesh side for about 1 minute. To plate: place a few heaping spoonfuls of purée on a dish. Gently place the salmon on top, skin-side up. Drizzle the garlic white wine sauce around the fish/purée (but not on top because it will make the skin soggy) and enjoy.